As one whose work responsibilities center around the use of internal and external social media, I am no stranger to hearing questions about the ROI (return on investment) of social media. Business leaders want to know if there is a hard, calculable, financial return to the business for using social media. I understand the question. I understand the motivation behind it. Businesses don’t want to spend money on something that does not return a value at least equal to the investment, preferably much more. Only in the case of regulatory requirements are businesses accustomed to having to spend on things that do not contribute positively to the bottom line. Explain why using ROI as the basis for whether or not a business uses social media is wrong-headed and demonstrates lack of understanding of the medium. Do I think it’s possible to demonstrate a positive ROI from using social media? Absolutely. There are a number of books that have been written on the subject. Doing so requires measurement of many things businesses may or may not be willing to invest in to determine the ROI, however. For example, if I claim that using internal social media provides answers to employees’ questions quicker than via other communication means, that would require that we measure how long it takes throughout the enterprise to answer a typical question via email chains, phone calls, voice mails, personal conversations and all the referrals and deferrals from one person to another before the answer is received. What business measures that? None that I know of. Consequently, a major value of using an enterprise social network – getting random questions answered more quickly than other ways – may be the personal experience and testimony of thousands within a company, yet impossible to measure in terms of ROI without the comparison data also being gathered for other forms of communication. Consider another commonly touted benefit of enterprise social networks – greater awareness of other areas of the business along with the additional contacts and relationships established via social media compared to businesses that do not use such networks. But how do you measure the ROI of that? There would be few that would claim such a benefit doesn’t happen or that is isn’t important, yet putting a financial figure to it is difficult at best. The above questions regarding internal social media can be answered if businesses are willing to generate and analyze the required metrics. When it comes to pondering ROI and the use of external social media channels such as Facebook, Twitter, YouTube, Pinterest, Google+, blogs, etc., many mistakenly try to make these channels primarily marketing channels rather than social channels. They try to constantly use social media to sell their products and services instead of focusing on the conversations, developing and enhancing relationships, and solving customer issues. Some want to compare money spent supporting these channels to other advertising media such as television and print ads. If you can’t quickly point to enough new accounts or product purchases resulting from social media, then the value of the channel is suspect in the eyes of some. It’s possible, of course, that tracking mechanisms can be embedded in external social media sites to help identify additional revenue sources, but that will not account for situations where the information gained via social channels is one of several factors in a consumer’s decision-making process acted upon at a later time by another method. Numerous questions need to be answered in order to quantify the ROI of external social media. For example, what is the impact of providing customer service via social channels compared to traditionally more expensive call centers? What is the value of turning someone publicly condemning your company into an advocate who remains a customer and sings your praises? Does the company’s presence and accessibility via social channels contribute positively to the public’s perception of the brand? Is the company’s involvement in social channels influencing the public conversations in ways beneficial to consumers as well as to the business in the long run? Does the company’s enthusiasm for and use of social media attract younger talent in a competitive market – talent that will turn down a job at a company too restrictive in its social media policy and use? Do online community managers engage both employees and external consumers in mutually beneficial ways that shorten the time to consumer issue resolution and product innovation? Social media is a communication channel. It is not primarily a marketing channel. The main focus is neither on increasing revenue nor reducing costs. The focus is on conversations, communication and relationships. Any business who thinks of it otherwise is like the bore at a party who does nothing but talk about himself. Do that very much in social media (or at a party) and you most assuredly lose. Since it is a communication channel, social media is akin to email, using telephones, texting, having face-to-face conversations, Web-based virtual meetings, mabye even the ancient arts of faxing and snail mail letters. Which of the communication channels in that previous sentence are constantly questioned regarding ROI? Only social media. Why? Because it’s the newest kid on the communication block. (By the way, it’s not new any more, folks. If your business isn’t embracing it, you’re just woefully late to the party.) When was the last time you heard a business leader question the ROI of email or of providing telephones for employees? It doesn’t happen because email and telephones are commonly accepted means of communication. They have been in use for so long that we can’t imagine a major business not using them. 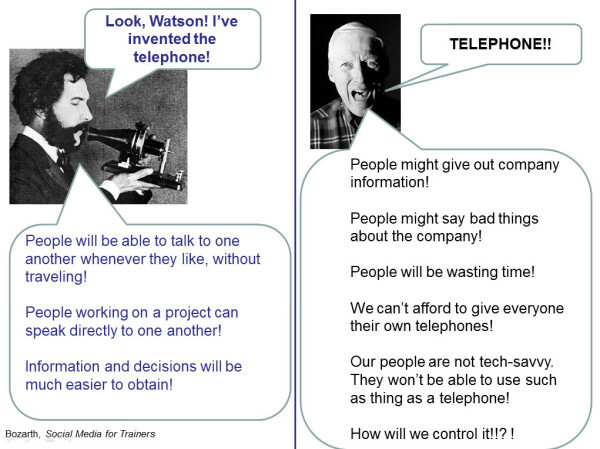 It’s so easy to imagine the conversation in the above cartoon happening (along with the mandatory ROI questions added) when businesses first started pondering the possibility of telephones on all employee desks, and again when email was entering the workplace, and again when access to the Web at work was becoming more common. Each of these media at some point was a very innovative and critical step in how companies communicate internally and externally – steps that no sensible business now questions. The same is true for social media today. It is a major communication channel growing in use and significance around the world for personal, political and professional purposes. Its role will not be questioned several years from now. Nobody will question its ROI in ten years because we won’t be able to imagine doing our business without it. So can we please move forward past the skepticism stage that comes with each new technological innovation and just concentrate on using it to communicate in beneficial ways? Stop holding social media to a different standard than other communication channels. Stop requiring its proponents to justify its existence for business in ways that are not required for any other non-marketing communication channel. Measure the ROI of social media in any and all ways you wish. It’s possible. Use any of these books to help you figure it out. But please don’t question the necessity of its use as a common communication channel for businesses regardless of ROI. If you expect your business to be here for the next round of technological innovations that will finally shift the conversation away from social media to what is yet to come, then accept this major shift in how communication happens today, use it to its fullest, and get on with business. Good stuff, Jeff. See also Wenger et al’s new conceptual framework for assessing value of interactions: http://www.learningsolutionsmag.com/articles/1019/nuts-and-bolts-assessing-the-value-of-online-interactions . I had a similar Twitter experience once when a book editor questioned whether readers in China could access an NPR page I referenced. I tweeted acquaintaince Lonnie Hodge, who lives/teaches in China, and had him check. Answer: Yes. Total interaction: 4 minutes. Thanks for the resource, Jane. The comment above is from a link to this post found on http://sambhalkezabaan.wordpress.com/2013/06/03/social-media-a-revolution-in-military-affairs/. Jeff, this is really cogent and helpful, thanks — I’m going to link to it from my own corpcomm blog. There’s a lot embedded in your mention of “full-time employees” — it’s obvious, but it’s also expensive, and there is huge head-count aversion these days in the large enterprises likeliest to care about ROI. I think the fastest way to get the revolution over with is to reconceive IT as a center of excellence for usage and strategy as well as for technology, and designated staff there are probably 1) power users generally, and 2) more than happy to rotate away from the Help Desk and show their firepower. PS Can’t resist a “new world” story of my own. Great recipe for squash rolls in the newspaper, just before Thanksgiving. I’m making a huge batch of them the night before, and I hit the wall on one detail, about 10:45pm. I take a chance and find the reporter on FB and message her — and she replies in 10 minutes with detailed tips. She didn’t do it because she’d gotten training at the newspaper about the strategic use of social — she did it because she’s a user and it’s fun and she loves her subject. And now she’s got (another) huge fan. Thanks, Bruce! Good input, and great story as well. I just saw the following article, “The Ignored Side of Social Media: Customer Service.” It helps reinforce the notion that companies must be involved in social media today due to customer service expectations. I can certainly attest to this given my company’s experience.